Question and Answer: Should Jesus Be Called "Yeshua"? The brother of our Lord said, “For every kind of beast and bird, of reptile and creature of the sea, is tamed and has been tamed by mankind” (James 3:7). 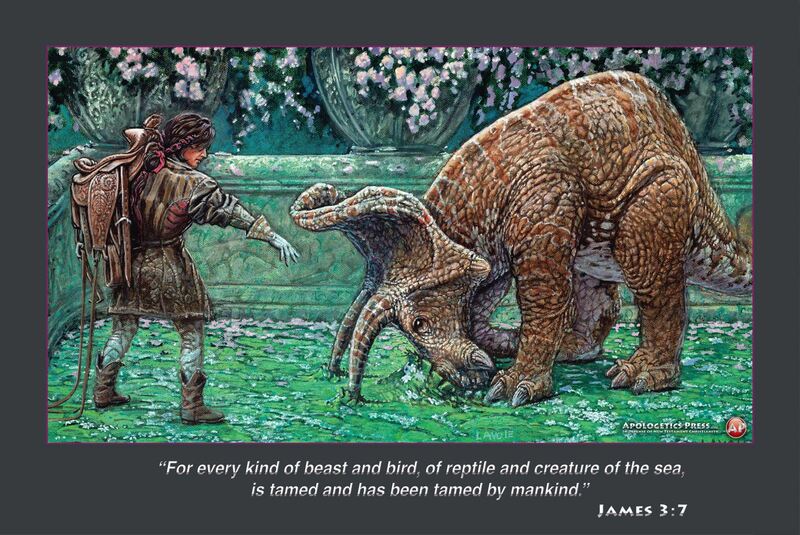 Since humans and dinosaurs were created by God on the same day of Creation week and, therefore, cohabited the Earth from the beginning, their interactions would have transpired in harmony with James’ inspired statement. In our ongoing effort to represent science, history, and the Bible accurately, Apologetics Press has just released a new poster that illustrates this truth. Titled “Down,” this fascinating piece of artwork by Lewis Lavoie offers one possible scenario depicting how humans could have actually interacted with dinosaurs, even taming them for human use. After all, God instructed the first humans to “be fruitful and multiply; fill the earth and subdue it; have dominion over the fish of the sea, over the birds of the air, and over every living thing that moves on the earth” (Genesis 1:28). Here is a full-color, visually stunning poster that will instill in the minds of both children and adults a more accurate portrait of historical reality than what the evolutionary community has presented—how life on Earth with dinosaurs could have been. This outstanding poster, complete with a relevant Bible verse, deserves to adorn the walls of children’s bedrooms, church classrooms, as well as secular offices and public schools. Don’t forget the other four posters previously released—all of which make great gifts.